First-winter Usually new winter feathers emerge in the scapular region from mid August, but sometimes they do not appear until early September. 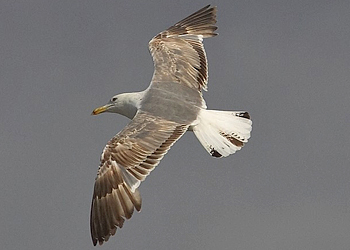 Although on average cachinnans moults earlier than argentatus, there is overlap. The new feathers often contrast with the bleached brown juvenile ones, having an anchor-pattern with a dark slate-black rhomboid at the base and a thin anchor blade. Usually most of the exposed body feathers will be moulted in the autumn and, in around 60% of individuals, anything from a few to up to about half of the wing coverts will be included in this post-juvenile moult. Most commonly the majority of the juvenile wing coverts are retained throughout the winter, but any observed moult in this region is a crucial fieldmark versus argentatus, as the latter virtually never renews it juvenile wing covert before April of their second calendar-year. The dark greater covert-bar decreases in conspicuousness as the autumn progresses and is often lost through bleaching, especially in southern latitudes (figs. 18-20). Michahellis also regularly moult wing coverts in the autumn of the first calendar-year. Clean grey feathers, which are practically unmarked, can already occur on cachinnans in its first-winter plumage, typically so on the lower row of scapulars (the last to be renewed), these being plain grey with only a fine dark shaft-streak. Although basically the mantle can be totally unmarked grey in first-summer birds (fig. 20) this is not typical until late in their second calendar-year, or early in their third. The head of first-winter cachinnans becomes slightly streaked but generally they retain a white-headed appearance, whereas michahellis on average shows more dark marks on the head. Caspian Gull cachinnans L-001754 2CY, January 13-14 2004, Lubna, Poland (Ruud Altenburg). 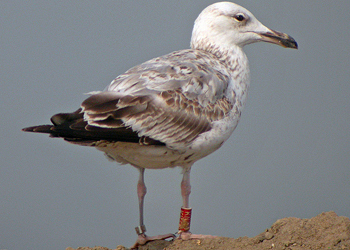 Ringed in Ukraine. Advanced bird, replaced nearly all visible coverts. Caspian Gull cachinnans 353P 2CY, January 08 2009, Deponie Pohlsche Heide - Minden, Germany (Armin Deutsch). From Poland. Replaced scapulars but no tertials or coverts. Caspian Gull cachinnans L-006330 2CY, 19 February 2012, Zagreb, Croatia (Mars Muusse). 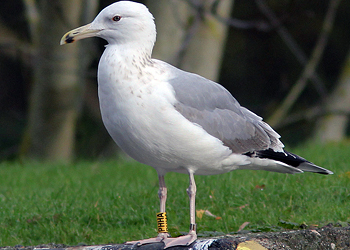 Ringed in Ukraine. Post-juvenile moult included just a single MC and scaps. Caspian Gull cachinnans 274P 2CY, February 28 2008, Deponie Pohlsche Heide - Minden, Germany (Armin Deutsch).Silvery grey scapular region. Together with argentatus. Caspian Gull cachinnans T-00222? 2CY, May 25 2007, Lubna, Poland (Ruud Altenburg). From Ukraine. In complete moult. Few central coverts were replaced in post-juvenile moult last autumn, now worn and very pale feathers. Herring Gull argenteus KN48 2CY, May 17-23 2007, Łubna, Poland (Ruud Altenburg). From Belarus. In active complete moult, MC row missing, upper TT missing. Caspian Gull cachinnans PKSB 2CY, June 25 2013, Deponie Pohlsche Heide - Minden, Germany (Armin Deutsch). Classic cachinnans. Bird in complete moult: P1-P4 fully grown, P5 growing, P6-P7 missing, P8-P10 old juvenile. Moult gap in central GC, exposing old juvenile secondaries underneath. Caspian Gull cachinnans L-006341 2CY, August 09 2012, Deponie Pohlsche Heide - Minden, Germany (Armin Deutsch). S1 new, tip of S2 just visible. Tips of new tail feathers also visible. Moult: P1-P6 fully grown, P9-P10 old. First-summer plumage New body feathers are grown during the winter, but the amount seems to vary individually. The general appearance is not altered much. New, uniformly grey feathers on the mantle give it a patchier appearance and the continued bleaching of wing coverts makes the whole bird look very pale by early spring. The bill usually becomes lighter prior to the breeding season with light patches on the basal portion. From this age onwards one quite often finds that an extensive part of the tip is light (horn-coloured or yellowish). 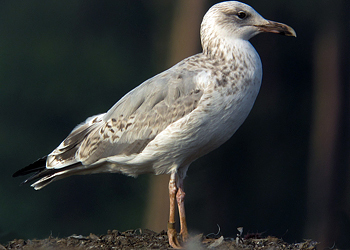 Second-winter plumage From late summer of the second calendar-year the mantle and scapulars are light greyish in their ground colour with a variable amount of dark patterning (fig. 21). At least in September few birds have an unmarked grey mantle. Typical features are scapular feathers which are grey with a dark shaft-streak, which is narrow or swollen to the shape of a club. 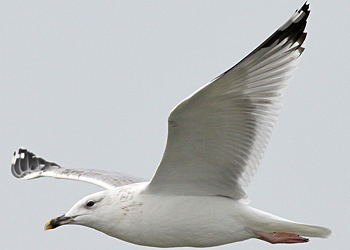 The underside is whiter and the underwing coverts can be almost white, sometimes with a few rows of darker spots (figs. 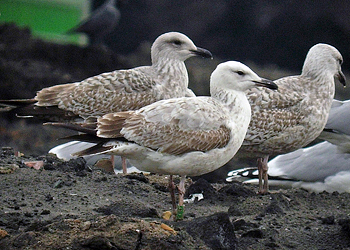 21c and 35); on michahellis and argentatus the coverts are well-marked. Many gain a white mirror on P10, but this is not seen in August-September as Pl0 is still growing. 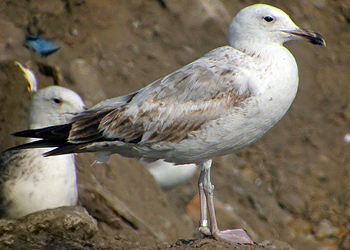 Typically the head is very white compared with most immature argentatus and the bill is usually predominately dark but also shows lighter areas. The bill very often develops some light areas during spring and summer of the second calendar-year but becomes darker again towards the non-breeding season. The iris remains dark. Caspian Gull cachinnans PKAC 2CY, November 19 2012, Deponie Pohlsche Heide - Minden, Germany (Armin Deutsch). All MC replaced again, now looking greyish. Also replaced: upper TT1-2, inner GC1-3 and probably a few single lesser coverts. Caspian Gull cachinnans PKBB 3CY, February 08 2013, Barneveld, the Netherlands (Maarten van Kleinwee). Note small mirror on 2nd gen P10. Complete row of MC replaced again in partial autumn moult. Caspian Gull cachinnans PESV 2CY, December 26 2012, Luik, Belgium (Jan Baert). Classic 2nd winter bird. Caspian Gull cachinnans PHXA 3CY, February 27 2013, Deponie Pohlsche Heide - Minden, Germany (Armin Deutsch). Small mirror on P10. MC replaced in partial autumn moult, greyish. Small compact bird, maybe female. Caspian Gull cachinnans 274P 3CY, May 17-23 2007, Łubna, Poland (Ruud Altenburg). From S Poland. 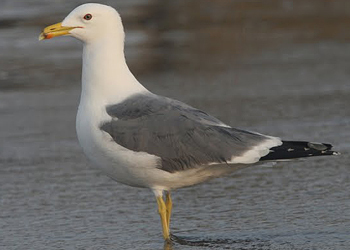 Probably pure Caspian Gull, however, the bill seems rather short and stubby for this species, it has saturated yellow legs and it is very round-headed; much resembling michahellis. Caspian Gull cachinnans PACX 3CY, July 01 2011, Deponie Pohlsche Heide - Minden, Germany (Armin Deutsch). Classic 2nd summer plumage: snow white head, saturated bare parts, active complete moult revealed by fresh coverts and upper tertials. Also, P1-P4 new adult-like 3rd gen, central primaries missing, P7-P10 still old 2nd gen.
Caspian Gull cachinnans 290P 3CY, August 09 2009, Lakolk, Denmark. Picture: Kent Olsen. From Poland. Note mirror on old 2nd gen P10. Bird in active complete moult: P6/P9. Note dark centred 2nd gen secondaries, visible now the central GC have been shed. At the same time, active moult in outermost secondaries and central tail feathers. Caspian Gull cachinnans T-001874 3CY, September 02 2011, Deponie Pohlsche Heide - Minden, Germany (Armin Deutsch). Last phase of complete moult: P9-P10 growing. PMS=45. Note pattern on 3rd gen (inner and central) primaries. Immature-looking bird from Ukraine. Second-summer plumage Most birds seem to acquire a clean grey mantle and scapulars late in the autumn or early in the winter of their second calendar-year. 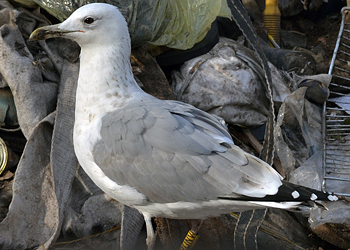 By late January most show unmarked grey mantle and scapulars, with or without a few lighter feathers (old bleached ones with some diffuse markings). The wing coverts are generally still immature-looking but many have acquired grey median coverts, a few inner greater coverts and the odd tertial. Later in spring an increasing number of grey wing coverts are grown, and will predominate in late summer. Third-winter It becomes more difficult to age sub-adult birds with any certainty from the day they drop the last primary of their second set. 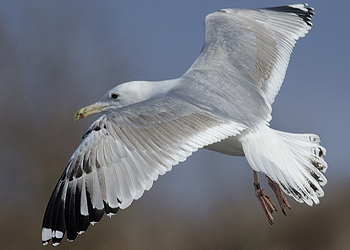 Sub-adult birds in third-winter plumage are basically all-grey but with a variable amount of retained dark patterning on the tertials, wing coverts and the bill. They show well developed white minors, and usually a collar of dark spots, most pronounced on the hindneck. The legs are usually very light grey or pink. The outer primary coverts and the tail feathers (usually) still have black markings. 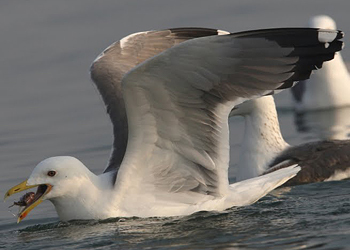 Often, the tertials show a large, well-defined blackish spot at the base, the rest of the feathers being pure grey. 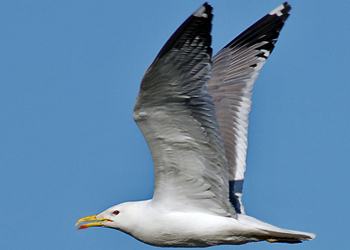 This pattern is extremely rare in any of the west European argentatus populations, but it does commonly occur in sub-adult smithsonianus. In general these near-adults are often very distinctive as they are white-headed with a dark iris and a marked collar of dark spots. Caspian Gull cachinnans PUNV 3CY, October 08 2012, Minden, Germany (Armin Deutsch). From Ukraine, probably female. Winter streaking concentrated in hindneck. Last vestiges of immaturity found in tail, primary coverts and brown wash on wing-coverts. Note also immature pattern and colour on bill. Caspian Gull cachinnans PDUS 4CY, February 08 2013, Barneveld, the Netherlands (Maarten van Kleinwee). From Poland. Much black in tail and black on greater primary coverts. 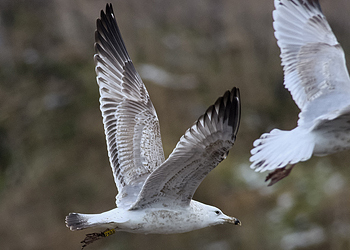 Caspian Gull cachinnans PHHA 3CY, December 02 2013, Namur, Belgium (Walther Leers). Reported many times on this location. Now with large mirrors, and already deep tongue on P10; classic bird with streaking in hindneck. 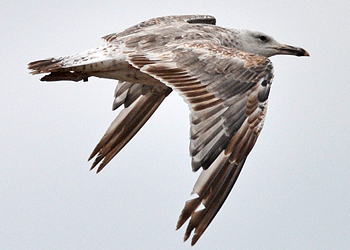 Caspian Gull cachinnans 3CY, October 19 2013, North Sea off Texel, The Netherlands (Albert de Jong). Adult-like outer primaries, combined with immature markings on coverts. Much black on bill. 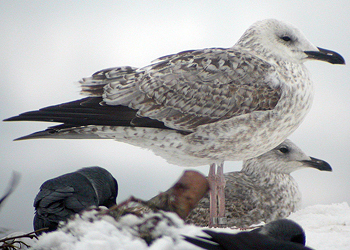 Steppe Gull barabensis-type 3CY, June 02 2007, Sverdlovsk oblast - SE Urals (Annika Forsten & Antero Lindholm). Common breeder in the forest-steppe zone lake area in Chelyabinsk oblast. In this bird, iris turning paler already. Darker grey upperparts than cachinnans. Steppe Gull barabensis-type 3CY, June 02 2007, Sverdlovsk oblast - SE Urals (Annika Forsten & Antero Lindholm). P2 fully grown, P4-P10 old 2nd gen. All but one of the rectrices replaced in winter quaters. Calls included below picture. 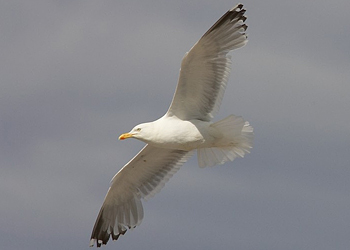 Steppe Gull barabensis-type adult, June 02 2007, Sverdlovsk oblast - SE Urals (Annika Forsten & Antero Lindholm). Mirror on P9 and P10, subterminal band on P10 broken, subterminal black on P4 as well, P3 not seen. Note stubby bill, speckled iris and slate grey upperparts. Steppe Gull barabensis-type adult, June 18 2010, Lepokurovo, Novosiberskaya O., Russia (Tatiana Bulyonkova). Full band on P10, small mirror on P9. Very short, greyish, tongue on underside of P10. Black reaching primary coverts on upperwing. Black on 8 primaries, full band on P4. Amber iris. 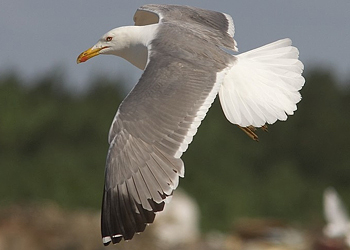 Steppe Gull barabensis-type adult, June 02 2007, Sverdlovsk oblast - SE Urals (Annika Forsten & Antero Lindholm). Parallel bill, pale iris. Broken band and short tongue on P10, mirror on P9, broken black band on P5. P3 dropped. 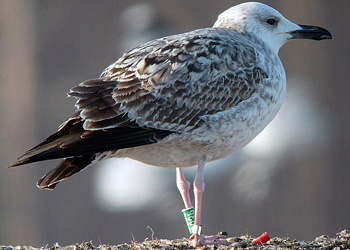 Steppe Gull barabensis-type adult, June 02 2007, Sverdlovsk oblast - SE Urals (Annika Forsten & Antero Lindholm). Mirror on P9 and P10, sub-terminal band on P10, sub-terminal black on P2, P1 dropped. PMS = 1. Note parallel bill, pale iris and slate grey upperparts. 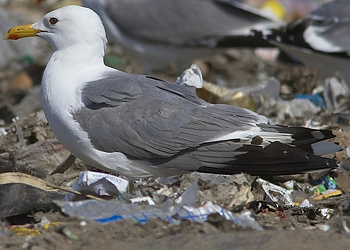 Steppe Gull barabensis adult, March 20 2010, Dubai, Oman (Chris Gibbins). 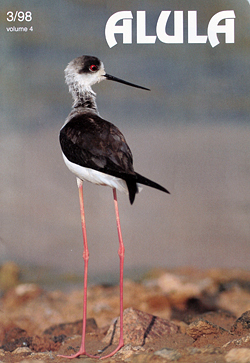 Note pot-bellied shape and relatively shorter legged impression than many cachinnans. Upperparts a shade darker than cachinnans. 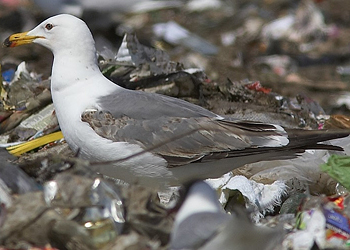 Here is a rather more compact, short-billed individual. 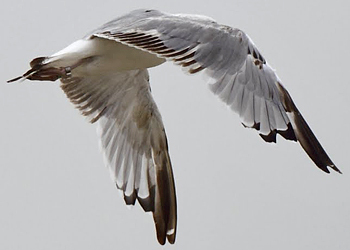 Steppe Gull barabensis adult, March 20 2010, Dubai, Oman (Chris Gibbins). P10 has a silvery tongue which varies in shape and length - this is a bird with medium length tongue, lacking the angular end which is characteristic for cachinnans. Barabensis is the least studied form within this complex, breeding in the northern half of Kazakhstan and south west Siberia. It was described as recently as 1960 by the Danish omithologist Hans Johansen as L. argentatus barabensis, and as being most closely related to cachinnans. Prior to Johansen`s publication in 1960, Russian omithologists treated it as a population of taimyrensis (eg. Stegmann 1934, Dementév 1951). It somehow forms a link between cachinnans and heuglini, but is geographically well separated from heuglini to the north, while the breeding range borders that of cachinnans in the south. From observations of barabensis on the breeding and wintering grounds it appears to be closest to cachinnans. The general behaviour, call, shape and especially the bill shape is more in line with cachinnans. Compared with cachinnans, barabensis is darker on the mantle, on average smaller and has more black on the wingtip (see plates C1 & C2). The grey shade of the mantle normally lies between 7.0-8.5 on the Kodak Scale (measured on 17 individuals from the breeding grounds). In the article in Var Fégelvarld (Jonsson 1996) the range of the shade was said to be 7.5-9.0 which is not correct. In February 1998 the author measured 34 individuals captured in Bahrain which gave a mean value of 7.7, with the darkest measuring 8.5. Some (presumed male) barabensis are large however, and can have a pretty sturdy bill with a marked gonys. Their morphological characters are clearly defined from those of heuglini and armenicus, but less so from those of cachinnans. It seems as if cachinnans winters primarily around the Black and Caspian Seas, being only partly migratory. It reaches the southernmost wintering areas in December, generally after it has finished its wing moult, having been forced southwards by central Asian/east European winter conditions. It returns northwards from late February onwards. In contrast, barabensis is a true migrant, vacating the entire breeding range in late summer/early autumn. The onset of the primary moult is in the latter half of May. Probably the wing moult is suspended as the outer primaries are still growing in November, but most have completed the moult by December. It winters along the coasts of the Arabian Sea, Persian Gulf, Red Sea and along the northeast African coast. In the Persian Gulf it is the dominant form. I estimated that 80-85% of the birds wintering in Bahrain in the winter of 1995/96 and February 1998 were barabensis and only around 10% were cachinnans. The relative abundance of the various forms may vary geographically within the Gulf. It is however a misconception that cachinnans is the predominant form there, as stated by Gamer 1996 and Yésou & Hirschfeldt 1997. Another problem is the question of how well defined these two forms are. Preliminary results from ongoing research point to two well defined populations with a limited degree of overlap (see also above, under Expansion of breeding range). My view is that they are rather well separated due to different migration strategies. There is, however, a little overlap between barabensis and cachinnans in the wingtip pattern and the darkness of the mantle, making identification of some individuals in the field difficult or even impossible. 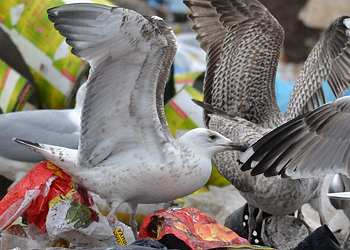 below: Several sub-adult Herring Gulls in April. Herring Gull (argenteus) 4CY A7MR April 26 2013, Boulogne-sur-Mer, NW France. Picture: Jean-Michel Sauvage. Herring Gull DA254408 5cy (argenteus), April 29 2012, Boulogne/Mer, France (50.42N,1.34E). Picture: J-M Sauvage. Herring Gull (argenteus) CKAM 4CY (3rd cycle), April 10 2011, Oostduinkerke, Belgium. Picture: Peter Adriaens. Herring Gull (argenteus) GFAM 4CY (3rd cycle), April 18 2010, Koksijde, Belgium. Picture: Peter Adriaens. 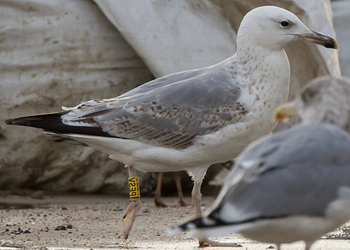 Herring Gull (argenteus) 1CY, 3CY & 4CY YDAC December 2012, September 2014 & April 2015, Calais, NW France. Picture: Jean-Michel Sauvage. Herring Gull (argenteus) BLB H-804002 4CY, April 30 2016, Katwijk, the Netherlands. Herring Gull (argenteus) T.R 4CY-5CY, April 2016 & May 2017, Katwijk, the Netherlands. Herring Gull (argenteus) 4.= 4CY, April 25 2017, Katwijk, the Netherlands. Herring Gull (argenteus) A||J 4CY, April 25 2017, Katwijk, the Netherlands. Herring Gull (argenteus) 2V 4CY (3rd cycle), April 05 2010, Koksijde, Belgium. Picture: Peter Adriaens. 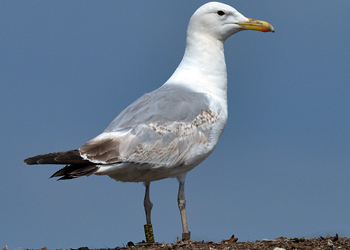 Herring Gull (argenteus) YBMD 1CY-4CY, August 2013 - April 2016, IJmuiden, the Netherlands. Herring Gull 5.364.712 4cy (argenteus), April 09 2004, Westkapelle, the Netherlands (51.33N 03.25E). Picture Pim Wolf. possible hybrid EP29 4cy (argenteus x michahellis), April 02 2000, Neeltje Jans, the Netherlands. Picture by Pim Wolf. possible hybrid EV65 4cy (argenteus x michahellis), April 02 2000, Neeltje Jans, the Netherlands. Picture by Pim Wolf. Herring Gull E 5cy (argenteus), April 25 2003, Scheveningen, the Netherlands. Herring Gull (argentatus) J970H 4CY, April 18 2017, Storholmen, Sande, Møre og Romsdal, Norway. Herring Gull argentatus sub-adult, April 03 2014, Pori, Finland. Picture: Petteri Mäkelä. Herring Gull argentatus 4CY, April 03 2017, Katwijk, the Netherlands. Herring Gull (argenteus) 4CY, April 18 2016, Katwijk, the Netherlands. Herring Gull (argenteus) sub-adult, April 18 2016, Katwijk, the Netherlands. Herring Gull 4CY, April 03 2017, Katwijk, the Netherlands. Herring Gull 4CY, April 02 2017, Katwijk, the Netherlands. Herring Gull sub-adult, April 02 2017, Katwijk, the Netherlands. 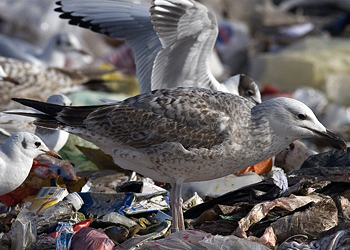 Herring Gull 4CY, April 05 2015, IJmuiden, the Netherlands. 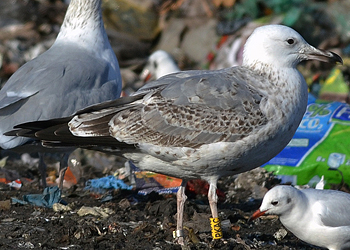 Herring Gull 3rd cycle (4CY), April 21 2015, IJmuiden, the Netherlands. 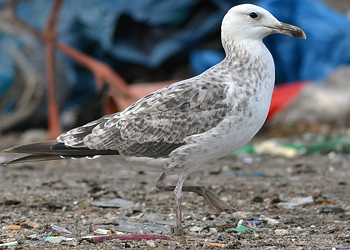 Herring Gull sub-adult, April 21 2015, IJmuiden, the Netherlands. 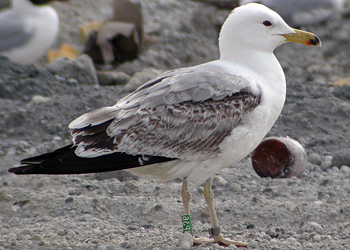 Herring Gull sub-adult, April 05 2015, IJmuiden, the Netherlands. Herring Gull sub-adult, April 23 2014, Katwijk, the Netherlands. Herring Gull 4CY, April 11 2014, Katwijk, the Netherlands. Herring Gull 4CY, April 17 2014, Katwijk, the Netherlands. Herring Gull 4CY, April 09 2014, Katwijk, the Netherlands. Herring Gull sub-adult, April 11 2014, Katwijk, the Netherlands. Herring Gull 4CY, April 09-11 2014, Katwijk, the Netherlands. Herring Gull sub-adult, April 09 2014, Katwijk, the Netherlands. Herring Gull sub-adult, April 17 2014, Katwijk, the Netherlands. Herring Gull 4cy, April 17 2012, Noordwijk, the Netherlands. Herring Gull (argenteus) 5CY, April 09 2016, IJmuiden, the Netherlands. Dark iris.